The third time appeared to be the charm. 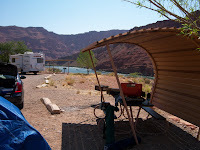 We found a choice site at Lees Ferry, complete with covered tables and overlooking the Colorado. It was beautiful. And it was time to get to work. There were two top priorities: food and shelter. We agreed Jesse would be in charge of the former, and I would take on the latter. I know we don't fit traditional gender roles, but he's pickier about food and I prefer building and putting things together. It might be different, but it works for us. I assembled the tent nearly all on my own, except for the part that called for two adults. 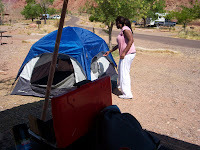 It was my very first tent assembly on my first ever camping trip. And it was successful. I was quite proud of our temporary homestead. Unfortunately I was so hungry, I didn't stop to take a picture. But trust me when I say that tent was a work of -- well of someone who follows very directions very well. We ate. We changed. We were sweaty. We went for a splash in the Colorado and were literally stopped cold. The river was extremely cold. Even more than that, it was numbing. As soon as I stepped in, my shins started stinging with numbing cold. I compare it to sticking your hand into a cooler full of melting ice and water and keeping it in there while you feel around for the last of that delicious beverage of your choosing. It was not refreshing. I was freezing on the bottom, yet my top was still sweating. Jesse and I went back and forth, in and out of the river, waiting for that moment when we were acclimated. We submerged more and different parts of our bodies but every time the needles came back. The river took my breath away. And we gave up. We walked up river for a bit. Jesse walked on the rocks while I split my time in and out of the water. 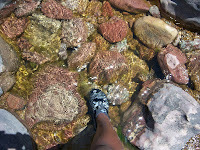 I was testing out my Teva Water Socks. They kept my feet warm, gave me added grip, and were cute to boot. Jesse was jealous and said other women we passed were as well. I think he was projecting. Eventually we realized we would not be cooling off in the Colorado. It was another sprinkle on the disappointment sundae. We also needed to sleep (as Jesse had been up for 24 hours and I had only napped in the car) and it was too hot for snoozing. We checked later and it was 102 degrees outside. The fan we brought just blew more hot air. Cool water evaporated, leaving only sweat. Finding a cool spot to sleep became imperative to us not killing each other. Unfortunately there were very few options. Jesse found one spot across a creek, but I could not follow. When I tried, I slipped -- even in my water socks. That happened twice. Not only am I sure I killed a tadpole, (and I am really sorry about that) but I was carrying my camera and pinkberry. I opted for the no water damage option. The next spot required a ten minute walk over hot sand. I swear my blood began boiling in my toes. I was glad to meet up with the frigid river at the end of that. I jumped in and filled my steaming socks. 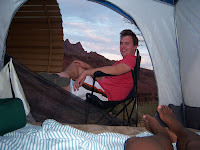 We did find a spot though - a shaded area along the river where we slept and tried to erase the day. i love that no matter what, you have your pinkberry.